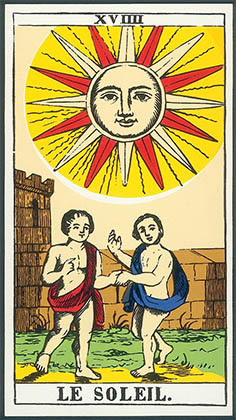 Cards from a reproduction of the Tarot d’Épinal by J. M. Simon, published by Éditions Arts et Lettres in 1976. Original dimensions: 11.7 cm x 6.4 cm. The Tarot d’Épinal was originally published by the Imagerie Pellerin in Épinal, using woodcuts engraved by François Georgin (1801-1863) c. 1830. Playing cards were made by the Imagerie d’Épinal until 1876. Many thanks to Adam West-Watson for supplying these images from his private collection of playing cards. Reproduced with the kind permission of France Cartes. Printed images – whether copies of existing art works, or original pictures made available to a large number of viewers through engraving, etching or lithography ­– flourished during the first half of the nineteenth century. Reproductions of paintings and drawings, as well as custom-made illustrations, were disseminated in books and periodicals that mixed art with literature. Colourful playing cards and educational materials were produced using woodcuts – and later through lithography – by printing houses, most famously, the Imagerie d’Épinal. Caricature became an increasingly important feature of the press. Poet and prose writer Gérard de Nerval (1808-1855) engaged with this popular visual culture. References to engravings and etchings feature in many of his writings, from Sylvie and Aurélia to ‘El Desdichado’, and his understanding of contemporary techniques of image reproduction is clear in his letter to Maurice Sand from 5 November 1853, in which he requests drawings for an illustrated edition of Sylvie. In this article, I explore the significance of a reference to a pack of tarot cards in one of his early stories, La Main enchantée. Emphasising that the importance of tarot cards, in this text, lies not only in their links with a supposedly ancient tradition, but also in the physical reality of their status as everyday printed images, I discuss further, more subtle tarot allusions in La Main enchantée, and argue that these provide a framework for the elaboration of different ‘selves’ and creative roles, which have implications for Nerval’s later writings. Earlier studies have argued for the importance of allusions to the tarot in Nerval’s writings. Jean Richer even suggests that the plot, imagery and characters of Aurélia are systematically organised around the ‘major arcana’ or tarot trump cards. For example, he argues that the narrator’s dream, in chapter two, about a temple of study recalls the ‘Papesse’ tarot card, and that the narrator’s dead uncle, who shows him around a room full of deceased ancestors in chapter four, plays the role of the ‘Empereur’. These arguments are intricate, and it seems likely that tarot symbols function as one of the many levels of association of this polysemous text. However, Richer attempts to impose fixed meanings on images which are both inherently ambiguous in themselves, and in a complex dialogue with other images; this approach neglects the importance of the multiplicity and the interaction of symbolic systems derived from different traditions and worldviews in Nerval’s texts. The idea that the tarot is the major governing force of Aurélia also minimises the text’s significance as an exploration of various states of consciousness, reducing its obscurity to that of a forgotten language or a secret code, which could be decoded if only we could find the key. The polyvalence of Nerval’s exploitation of tarot symbols can perhaps most easily be observed in his famous sonnet, ‘El Desdichado’. Because of its difficulty, the idea that it could be deciphered through tarot symbolism is particularly appealing. 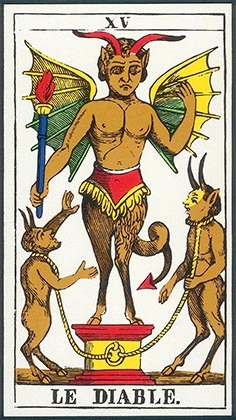 Images such as ‘le ténébreux’, ‘la tour abolie’, ‘ma seule étoile’, and ‘le Soleil noir’ may evoke, on one level, the ‘Diable’, ‘Maison (de) Dieu’, ‘Étoile’ and ‘Soleil’ tarot trump cards, respectively. 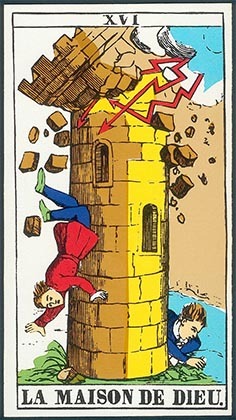 Thus, building on the pictorial and traditional occult symbolism of individual tarot cards, the link between ‘le ténébreux’ and the ‘Diable’ card might introduce the notion of evil or hidden forces in relation to the speaker; the ‘Maison (de) Dieu’, with its crumbling tower, could symbolise the speaker’s misfortune or humiliation; the ‘seule étoile’, being dead, might represent the loss of hope, truth, or direction; and the ‘Soleil noir’, a kind of negation of the ‘Soleil’ card, could point to the overshadowing of light, joy and happiness. However, just as tarot readers believe that the meaning of the tarot cards depends on their position within a ‘spread’ and their relationships with other cards, the apparent tarot symbols used by Nerval are complicated by their position within the sonnet structure, by their interaction with other systems of meaning, and by the context of their use in Nerval’s other texts. The rhyming of ‘abolie’ and ‘Mélancolie’ links the speaker’s downfall (‘tour abolie’) with a more personal psychological state, but also brings the tarot symbol into contact with a reference to Albrecht Dürer’s engraving, which will be repeated in Aurélia. 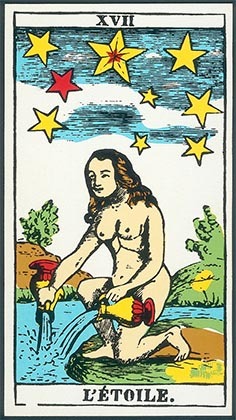 In addition to tarot symbolism of hope, truth, and direction, the speaker’s ‘seule étoile’ evokes a female figure (the card features a naked woman pouring fluid from two containers into an expanse of water). Richer’s claim that this figure represents Jenny Colon is simplistic; potential autobiographical correspondences add further layers of meaning, but there is nothing to suggest that the speaker in this poem functions solely as the poet. Finally, L’Étoile is one of the two main characters from Paul Scarron’s Roman comique (1651, 1657), and also features in Nerval’s Roman tragique (1844). Identifying with Scarron’s Le Destin, the protagonist, Brisacier, refers to this character as his ‘belle étoile de comédie’. The associations of the ‘Étoile’ tarot card are, therefore, linked with a comic tradition, as well as the hyperbole of Le Roman tragique. The coexistence in one image of these incompatible associations undermines the idea that the tarot could function as a straightforward key to ‘El Desdichado’. Despite the claims of some practitioners that the origins of tarot cards are unknown, or even that they date back to ancient Egypt, historians of playing cards agree that they originated in Northern Italy in the first half of the fifteenth century, and were not widely known in France before the sixteenth century. Until the beginnings of tarot cartomancy in the late eighteenth century, they were used only as playing cards. However, by the early nineteenth century, tarot cards – as well as the myth of their ancient origins ­– had been incorporated into the French occult tradition, thanks to figures such as Antoine Court de Gébelin (c.1719–1784), the Compte de Mellet (1727–1804), and Jean-Baptiste Alliette (known as Etteilla, 1738–1791). Fortune-telling was illegal in France in the early years of the nineteenth century, but cartomancy was, nonetheless, very common. Nerval’s interest in the occult is evident in Les Illuminés, in which he describes the lives of minor figures in eighteenth-century esoteric thought, such as the mystic writers Rétif de la Bretonne and Jacques Cazotte, the Italian mesmerist and charlatan Cagliostro, and the esoteric philosopher Quintus Aucler. He also wrote Nicolas Flamel (1831), a play about the fourteenth-century scribe and manuscript-seller, who was popularly believed to have been an alchemist. In Histoire de la reine du Matin et de Soliman, prince des génies (a conte which forms part of Voyage en Orient), Nerval adapts the story of the construction of the Temple of Solomon, which is central to Masonic tradition. Georges Le Breton argues that the ‘key’ to Les Chimères is Antoine-Joseph Pernety’s Dictionnaire mytho-hermétique (1758). However, Nerval’s exploration of this heritage does not show a great deal of reverence for occult tradition; Les Illuminés focusses on the lives of marginal, unsuccessful, isolated figures, rather than masters of esoteric philosophy, and he changes many of the known facts about the figures whose lives he describes. For example, there is no evidence that Raoul Spifame bore an uncanny physical resemblance to Henri II, and Nerval’s claims that he did are improbable, given that Spifame was nineteen years older than the king. Max Milner argues that Nerval did not include any true masters of eighteenth-century esoteric thought (for example, Emanuel Swedenborg, Johann Kaspar Lavater, Martinès de Pasqually) because the lowly figures better reflected his own personality. Set in the seventeenth century, Nerval’s La Main enchantée ­is also rooted in popular occult culture; the central image of this text, the main de gloire, featured in the popular grimoire, Le Petit Albert. Such gruesome occult images were well known in nineteenth-century France; Le Petit Albert had an extensive readership, as it was distributed through colportage. In Nerval’s story, the escamoteur (a cross between a conjurer and a fortune-teller), who goes by the name of maître Gonin, uses palmistry to make his prediction that the protagonist, Eustache Bouteroue, will end up on the gallows. It may be useful at this point to explain how this prediction comes true and the main character’s hand is turned into a main de gloire. C’était un garçon sage, bien entendu dans le commerce, et qui n’employait point ses loisirs à jouer à la boule ou à la paume, comme bien d’autres, mais à faire des comptes, à lire le Bocage des six corporations, et à apprendre un peu d’espagnol, qu’il était bon qu’un marchand sût parler, comme aujourd’hui l’anglais, à cause de la quantité de personnes de cette nation qui habitaient dans Paris. Maître Goubard s’étant donc, en six années, convaincu de la parfaite honnêteté et du caractère excellent de son commis, ayant de plus surpris entre sa fille et lui quelque penchant bien vertueux et bien sévèrement comprimé des deux parts, avait résolu de les unir à la Saint-Jean d’été, et de se retirer ensuite à Laon, en Picardie, où il avait du bien de famille. After the escamoteur’s ambiguous prediction that ‘vous irez haut, très haut…vous mourrez plus grand que vous n’êtes’, the apparently virtuous Eustache’s life takes a turn for the worse. His fiancée’s nephew – a drunken soldier on leave who undermines Eustache at every opportunity – turns up to stay with the family and refuses to depart, even after Eustache and Javotte are married. When Eustache finally loses his temper and locks the soldier out of the house, he finds himself challenged to a duel. Knowing that he has no chance of beating the soldier, he enlists the help of the escamoteur (who also appears to have magic powers). The escamoteur casts a spell on Eustache’s hand, ensuring that he will win the duel, but demands more money than Eustache can ever hope to afford – payable after the duel. Eustache’s enchanted hand, seemingly acting autonomously from the rest of his body, wins the duel for him, and the soldier is killed. This raises further problems, however, because duels are technically illegal, and the fact that the soldier was killed makes it more likely that Eustache will be pursued. After several sleepless nights, Eustache decides to approach a magistrate (Me Chevassut) – who is a friend of Javotte’s father and whom Eustache has previously met through his business – for help. The magistrate agrees to help him, but Eustache’s enchanted hand then attacks Me Chevassut – against Eustache’s will – because he has failed to pay his debt for the spell. Eustache is arrested and imprisoned. While in prison, he is visited by the escamoteur, who tells him of his plan to use Eustache’s hand as a main de gloire after he has been executed. Indeed, once Eustache has been hanged, his enchanted hand comes back to life, is hacked off by the executioner, and makes its own way to the escamoteur’s home. La Main enchantée was originally published in 1832, under the title La Main de gloire: Histoire maccaronique. Along with Le Monstre vert and La Reine des poissons, it was included in Contes et facéties in 1852. The heyday of the facétie – a lighthearted burlesque tale, often involving a humorous reinterpretation of a historical or mythological figure or story, and finishing with a twist or a ‘bon mot’ – was during the sixteenth century, but there was a resurgence in the popularity of this and related subgenres (for example, contes facétieux) in the 1830s. For example, Balzac published his Contes drolatiques between 1832 and 1837. As Jacques Bony has remarked, since Contes et facéties only contains three stories, Nerval must have considered at least one of these to be both a conte and a facétie. La Main enchantée involves elements of the facétie, such as its obvious Faustian overtones, its invented roots in a real event and historical sources, the far-fetched nature of the plot, and the humorous use of historical slang. However, the invented quotation at the end of the story which emphasises that the text is probably just ‘une de ces baies bonnes pour amuser les enfants autour du feu’, and that it should not be taken seriously, may constitute a trap for the reader. As Jacques Bony has pointed out, despite the humorous way in which the story is narrated, Eustache’s involuntary attack on Me Chevassut is echoed in Aurélia, a text which readers tend to take much more seriously: ‘[…] je me disputai avec un inconnu, à qui je donnai un rude soufflet; je ne sais comment cela n’eut aucune suite’. Another possible link between this incident and La Main enchantée is the fact that the sentence which follows the mention of the ‘rude soufflet’ in Aurélia refers to ‘l’horloge de Saint-Eustache’. St. Eustace, for whom the church in Paris is named, was a Roman soldier who converted to Christianity after seeing a vision of a crucifix in the antlers of a stag. He endured a series of calamities to test his faith. According to a legend, St. Eustace and his family were roasted in a bronze statue representing a bull or an ox, on the orders of the emperor Hadrian, when he refused to make a pagan sacrifice. In contrast with the fate of the Christian martyr, however, there is no obvious overarching framework which would seem to make sense of Eustache Bouteroue’s calvary. Dismembered limbs, a severed head, a hand cut off at the wrist, feet which dance by themselves — all these have something peculiarly uncanny about them, especially when […] they prove able to move of themselves in addition. As we already know, this kind of uncanniness springs from its association with the castration complex. It is certainly true that all of the representatives of authority in this story are either unreliable or downright dangerous; neither Eustache’s employer, maître Goubard, nor Me Chevassut (the magistrate), succeeds in protecting him from harm, while the escamoteur is presented as the direct cause of his downfall. An apparently unexplained comparison between Eustache and the ‘chevalier Tord-Chêne’, at the moment of Eustache’s victory in the duel with Javotte’s nephew, seems to evoke the ‘bad uncle’ figure from La Reine des Poissons. But throughout Eustache’s trials, and despite the gory events which take place, a light-hearted tone is maintained in La Main enchantée. It may be that, as a short and relatively minor prose subgenre, in which both fantastical elements and humour are expected, the conte acts as a space for Nerval to play out psychological preoccupations, while simultaneously making light of them; the fluidity of the boundaries between the conte and the facétie could only facilitate this covert exploration. There is only one explicit reference to tarot cards in La Main enchantée. Having killed Javotte’s nephew, Eustache finds a ‘jeu de tarots sale et écorné’ in the dead man’s pockets. Given that the story is set in the seventeenth century, and unless Nerval is being anachronistic, it is most likely that the soldier used these in card games, rather than for fortune-telling. However, a link between cards and fate is established at the beginning of the story, when, in order to attract the attention of the crowd, the escamoteur claims that he can predict the future ‘par la cartomancie, la chiromancie, et les nombres pythagoriques’. On a surface level, the disastrous events which befall Eustache have their root in the fact that he takes one of the cards which the escamoteur distributes to bystanders; he is impressed with the accuracy of the escamoteur’s knowledge about his current circumstances, and allows him to read his palm in order to tell his future. 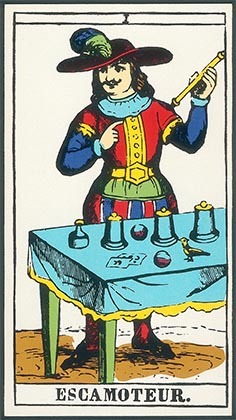 Given the time period in which the story is set, it is most likely that the escamoteur was practising cartomancy using standard playing cards. It could be argued, however, that, in his construction of this text, Nerval draws on the soldier’s tarnished tarot deck and imbues it with new meanings. 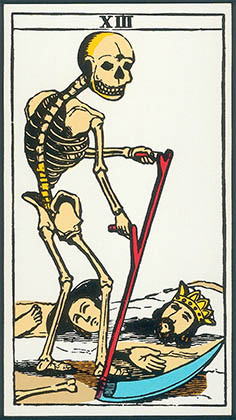 It would be possible to see Eustache’s severed hand as suggesting the ‘La Mort’ tarot card, which features a skeleton mowing a field of human body parts. 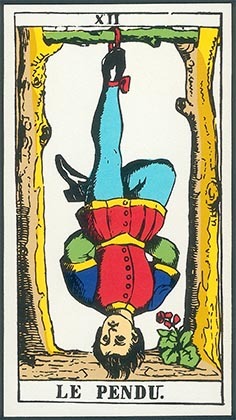 The protagonist’s death by hanging may suggest the ‘Pendu’ card, while the escamoteur who tricks Eustache evokes the ‘Bateleur’, a card which is renamed the ‘Escamoteur’ in the Tarot d’Épinal. On one level, Nerval’s possible allusions to tarot cards in this text, which is concerned with themes of luck and fate, seem to echo its major themes and provide a suggestive aesthetic framework. However, the ambiguity of the narration obscures the possibility that La Main enchantée involves an implicit critique of the concept of destiny upon which the occult associations of tarot depend. There are indications in this text that Eustache – despite the narrator’s insistence on his honourable character – may be a figure of ridicule, and that those who seem to cause his downfall may also have positive characteristics. For example, not satisfied to complete his shift on the night watch in his ordinary clothes and with a borrowed weapon, Eustache insists on buying ‘une épée à coquille qui n’avait plus de coquille, une salade et un haubergeon en cuivre rouge que menaçait déjà le marteau d’un chaudronnier’. Needless to say, this ensemble does not have the desired effect. 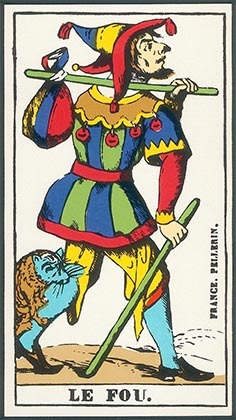 It could be argued that his appearance evokes that of the tarot fool (‘Le Fou’). His decision to lock Javotte’s nephew out of the house could be considered a silly choice, and the narrator describes him at this point as ‘un couard qui s’est monté la tête’. This description proves justified when he decides not to attend the first duel proposed by the soldier; he only attends the second one when threatened by the soldier’s messenger. Also, the need to pay his debt to the escamoteur does not even occur to Eustache after the duel. The narrator does not mention the fact that Eustache has not taken action regarding his debt. Though Javotte’s nephew is a trying guest, the narrator concedes that he ‘n’avait pas le cœur mauvais’; seeing that Eustache has no chance of victory in the duel, the nephew decides ‘de ne lui faire qu’une égratinure’. More importantly, the narrator’s descriptions of the escamoteur – who seems to be at least indirectly responsible for Eustache’s fate – are generally admiring, at least in the early stages of the story. For example, he is described as wearing his ‘vieux costume de bouffon’ with dignity and the nineteenth-century narrator bemoans the fact that bohemians like him are ‘noyé[s] et perdu[s] dans la laideur et l’insignifiance de nos têtes bourgeoises’. Further, although the escamoteur takes advantage of the difficult situation in which Eustache finds himself, his predictions are accurate and he keeps his side of the bargain. So, is Eustache Bouteroue a tarot fool? A sympathetic, but ultimately naïve and ridiculous character? Is the maître Gonin a figure of the tarot ‘Bateleur’ or ‘Escamoteur’ card, and is he the real hero of Nerval’s text? At certain points, the narrator’s descriptions of both characters seem to encourage this view. The escamoteur achieves what he had set out to do and succeeds in performing a particularly ambitious form of black magic. He is talented and accomplished. In contrast, Eustache seems to be propelled from blunder to blunder by forces beyond his understanding. In 1850, Nerval composed a scenario with Auguste Maquet, entitled La Main de gloire, in which the basic plot of La Main enchantée is modified; the figure of the escamoteur is replaced by a young scholar, Cyprien, who is presented as the hero of the story; Eustache is relegated to the periphery. It is important to emphasise, however, that Cyprien is less manipulative than the escamoteur; he does recuperate Eustache’s hand after his death to make a main de gloire, but resists the temptation to use it for evil, eventually throwing it on the ground and extinguishing it. Further, in La Main enchantée, the limits of the escamoteur’s powers are revealed when he visits Eustache in prison; although he has complete confidence that he will one day succeed in turning base metals into gold, he has so far only managed to turn gold into iron. We may wonder whether he has deceived himself as much as Eustache. The struggle between Eustache and the escamoteur for control of the hand (which does not belong completely to either of them) may suggest that Nerval used La Main enchantée as an arena in which to explore different ‘selves’ or creative roles. The centrality of the symbol of the hand supports a link with the writing process. Eustache may represent the passionate but trouble-prone side of Nerval’s ‘self’, the ‘pauvre Gérard’ later described by Alexandre Dumas (1853), or the unfocussed energy necessary to fuel successful writing. In contrast, the escamoteur may be a figure of the craft, manipulation, and deception necessary to practice verbal magic. In identifying either Eustache or the escamoteur as the hero in this story, we may fall into a trap against which by any self-respecting fortune-teller might caution: forgetting that each individual card is only part of the picture; everything depends on the interactions between them. The allusions to the ‘Escamoteur’ and ‘Le Fou’ tarot cards which seem to lurk under the surface of this text may emphasise the fact that Eustache and the escamoteur do not represent fully developed characters, but rather aspects of a divided self, or opposing creative impulses. Nerval was certainly interested in tarot cards, but we cannot know to what extent he believed in their occult origins. The reference to the dirty, dog-eared tarot deck in Javotte’s nephew’s pockets, and the misfortune which appears to result from the escamoteur’s predictions, may indicate scepticism or irony in relation to occult traditions. In the nineteenth century, tarot cards evoked, on one level, a mystical tradition popularly believed to date back to ancient Egypt. Yet the cards, as physical objects, were banal reproductions of a fifteenth-century card game, used by fortune-tellers in order to exploit the credulity of gullible people. These contradictory associations are appropriate in a text which constantly raises the question of whether it should be taken seriously. However, we also know that Nerval exploits tarot symbols in later texts such as Aurélia, and Les Chimères, which present themselves as sincere. But even these texts, as we have seen in relation to ‘El Desdichado’, involve a first-person voice which combines comedy and disaster. It is the voice of a speaker who has insight into poetic creativity but who is constantly dragged down to earth by the impossibility of his task. This figure seems to combine some of the traits of Eustache and the maître Gonin, or ‘Le Fou’ and ‘L’Escamoteur’. In the tarot, Nerval chose symbols which, by the nineteenth century, had acquired more meanings than those who used them to predict the future might have admitted; they were both tarnished and enriched by their status as endlessly reproducible images masquerading as relics from an ancient tradition. In describing Javotte’s nephew’s deck of tarot cards as ‘sale et écorné’, Nerval reveals his own impulse to generate new meanings for these images. By using the roles they depict to give voice to personal concerns, he imprints them with further associations, while not entirely extinguishing their traditional occult symbolism. These reworked tarot images will be further explored and modified in different contexts in later texts, but they retain the paradoxical coexistence of comedy and depth that they picked up in La Main enchantée. Conscious that he was working with hand-me-down images, Nerval exploited the ironic potentialities of tarot cards, while, at the same time, managing to conserve something of their popular associations with the themes of destiny, success, and failure, which are central to his writings as a whole. Bony, Jacques. Le Récit nervalien. Paris: José Corti, 1990. Bony, Jacques. ‘Contes et facéties: Notice générale.’ In Gérard de Nerval : Œuvres Complètes, volume III. Edited by J. Guillaume and C. Pichois. Paris: Gallimard, 1993. Brix, Michel. ‘Récit biographique et création littéraire : le cas des Illuminés de Nerval’. Cahiers de l’Association internationale des études françaises 52,1 (2000): 183-199. Decker, Ronald, Thierry Depaulis and Michael Dummett. A Wicked Pack of Cards: The Origins of the Occult Tarot. London: Duckworth, 1996/2002. Depaulis, Thierry. Tarot, jeu et magie. Paris: Bibliothèque nationale de France, 1984. Dumas, Alexandre. ‘Causerie avec mes lecteurs’. Le Mousquetaire. 10 December 1853. Accessed 21 March 2015. http://alexandredumas.org/eJ/journal/Le_Mousquetaire/1853-12-10/1 . Falconnier, R. Les XXII Lames hérmétiques du tarot divinatoire exactement reconstituées d’après les textes sacrés et selon la tradition des mages de l’ancienne Égypte. Paris: Librairie de l’Art Indépendant, 1896. Freud, Sigmund. ‘The Uncanny’. In An Infantile Neurosis and Other Works. The Standard Edition of the Complete Psychological Works of Sigmund Freud, vol. XVII, translated by James Strachey, 219-252. London: The Hogarth Press, 1919/1955. Garnier, J. M. Histoire de L’Imagerie populaire et des cartes à jouer à Chartres. Chartres: Imprimerie de Garnier, 1869. Garnier-Pelle, Nicole and Maxime Préaud. L’Imagerie populaire française: Images d’Épinal gravées sur bois (vol. II). Paris: Éditions des musées nationaux, 1996. Grand Orient. A Manual of Cartomancy, Fortune-Telling and Occult Divination. London: William Ryder & Son, Ltd., 1909. Hillen, Sabine Madeleine. ‘La Main coupée ou la forme d’un récit bref chez Nerval, Maupassant et Schwob’. Revue romane 29 (1994) : 71-81. Le Breton, Georges. Nerval poète alchimique: La clef des Chimères et des Mémorables d’Aurélia : le Dictionnaire mytho-hermétique de Dom Pernety. Paris: Curandera, 1982. Mandrou, Robert. ‘Littérature de colportage et mentalités paysannes, XVIIe-XVIIIe siècles’. Études rurales 15.15 (1964): 72-85. Mauron, Charles. ‘Nerval et la psycho-critique’. Cahiers du Sud 293 (January-February 1949): 76-92. Miguet, Thierry. ‘Formes, nombres et couleurs dans La Main enchantée’. In Nerval : une poétique du rêve, edited by André Guyaux and Robert Kopp, 67-78. Paris: Honoré Champion, 1989. Milner, Max. ‘Les Illuminés’. In Gérard de Nerval : Œuvres Complètes II. Edited by J. Guillaume and C. Pichois. Paris: Gallimard, 1984. Mounic, Anne. ‘Les mains de Nerval, Maupassant et Verlaine’. Temporel 5 (2008). Accessed 30 March 2015. Mozzani, Éloïse. Magie et superstitions de la fin de l’Ancien Régime à la Restauration. Paris : Laffont, 1988. Richer, Jean. Nerval : Expérience et Création. Paris : Hachette, 1963. Richer, Jean. Nerval au Royaume des archétypes : « Octavie », « Sylvie », Aurélia. Paris : Lettres Modernes, 1971. Steinmetz, Jean-Luc. ‘La Main enchantée : Notice.’ In Gérard de Nerval: Œuvres Complètes, III. Edited by J. Guillaume and C.Pichois. Paris: Gallimard, 1993. Waite, Arthur Edmund. The Pictorial Key to the Tarot Being Fragments of a Secret Tradition under the Veil of Divination. London: William Ryder & Son, Ltd., 1910. Weber, Henri. ‘La facétie et la littérature facétieuse au colloque de Goutelas’. Bulletin de l’Association d’étude sur l’humanisme, la réforme et la renaissance 6 (1977): 28-33. Thierry Depaulis, Tarot, jeu et magie (Paris : Bibliothèque nationale de France, 1984), 77. For information on the Imagerie d’Épinal, see Nicole Garnier-Pelle and Maxime Préaud, L’Imagerie populaire française, vol. II. (Paris: Éditions des musées nationaux, 1996). For information on other nineteenth-century printing houses specialising in image reproduction (for example those at Metz, Nancy, Wissembourg, and the Imagerie Glémarec in Paris), see J. M. Garnier Histoire de L’Imagerie populaire et des cartes à jouer à Chartres (Chartres: Imprimerie de Garnier, 1869). First published in the Revue des Deux Mondes (15 August 1853), and also included in Les Filles du Feu (28 January 1854). Published in two instalments in the Revue de Paris on 1 January and 15 February 1855. First published in Le Mousquetaire (10 December 1853). Reprinted in L’Artiste (1 January 1854) and attached, with the other sonnets of Les Chimères, to Les Filles du Feu (28 January 1854). ‘J’ai rencontré Hetzel, qui se trouvait à Paris. Il ne voit que vous qui puissiez me faire des dessins que l’on convertirait en bois ou en eaux-fortes. Croyez-vous avoir le temps de crayonner quelques croquis ? […] J’ai vu chez Giraud des dessins coloriés de vous qui sont charmants. Il suffirait de croquis même, puisqu’il faudra toujours mettre sur bois.’ Gérard de Nerval, Œuvres complètes, Volume Three, ed. Jean Guillaume and Claude Pichois (Paris: Gallimard, 1993), 819-821. Henceforth, references to this volume will be abbreviated as follows: OC III. First published as La Main de gloire. Histoire maccaronique in Le Cabinet de lecture (24 September 1832). Appeared in August 1838 in Le Messager under the title Une cause célèbre du Parlement de Paris, 1617. An illustrated edition entitled La Main de gloire, histoire macaronique was published in 1844 in Revue pittoresque, Musée littéraire illustré par les premiers artistes. Finally, the story was included as La Main enchantée in Contes et facéties in 1852. Jean Richer, Nerval au Royaume des archétypes : « Octavie », « Sylvie », Aurélia (Paris : Lettres Modernes, 1971). Richer, Nerval au royaume des archétypes, 50-51. Richer cites Georges Le Breton’s thesis that this poem evokes ‘Le Diable’, ‘La Maison Dieu’ and ‘L’Étoile’, but Richer himself argues that ‘Il nous semble que les images du sonnet El Desdichado sont nées, pour une grande part, d’une méditation sur son thème astrologique de naissance’. Jean Richer, Nerval : Expérience et création (Paris : Hachette, 1963), 555. Also known as the ‘prince des ténèbres’. Information on the traditional occult meanings of tarot symbols was gathered from sources such as Arthur Edward Waite’s The Pictorial Key to the Tarot (1910), A Manual of Cartomancy, Fortune-Telling and Occult Divination by Grand Orient (1909), and Les XXII Lames Hérmétiques du Tarot Divinatoire by R. Falconnier (1896). However, differences of opinion among tarot readers with regard to the meaning(s) of each card have existed since the cards became part of the occult tradition in France in the eighteenth century. ‘De manière évidente, Gérard se réfère à la mort de Jenny Colon, morte en 1842’ (Richer, Expérience et création, 558). Jenny Colon was an actress for whom Nerval had a feverish admiration. Gérard de Nerval, Œuvres complètes, Volume One, ed. Jean Guillaume and Claude Pichois (Paris: Gallimard, 1989), 701. Le Roman tragique, which defines itself as a sequel to Scarron’s Roman comique (despite its many links with other texts) was first published in L’Artiste in 1844. Ten years later, Nerval inserted it into the preface to Les Filles du feu (1854) entitled À Alexandre Dumas. The protagonist, Brisacier, is torn between identifying with Le Destin, the leading actor of Scarron’s troupe, and Ragotin, the foolish poet who accompanies them. An early version of ‘El Desdichado’ was entitled ‘Le Destin’. Ronald Decker et al., A Wicked Pack of Cards: The Origins of the Occult Tarot (London: Duckworth, 2002/1996), 27-28. Cartomancy involves fortune-telling using cards. Decker et al., A Wicked Pack of Cards, 32. Antoine Court de Gébelin’s date of birth is uncertain. See Decker et al., A Wicked Pack of Cards, 53-54. Eloïse Mozzani, Magie et superstitions, de la fin de l’Ancien Régime à la Restauration (Paris: Éditions Robert Laffont, 1988), 147. Published in 1852, Les Illuminés is a collection of texts originally published between 1839 (Le Roi de Bicêtre) and 1851 (Quintus Aucler). This text also contains the stories of the sixteenth-century eccentric, Raoul Spifame (author of Dichaerchiae Henrici regis christianissimi progymnasta, a collection of falsified ‘rulings’ by Henri II), as well as the Abbé de Bucquoy (who also features in Les Faux Saulniers (1850)). Voyage en Orient is made up of texts published over ten years. The definitive version was published in 1851. Georges Le Breton, Nerval poète alchimique: La clef des Chimères et des Mémorables d’Aurélia : le Dictionnaire mytho-hermétique de Dom Pernety (Paris : Curandera, 1982). Michel Brix, ‘Récit biographique et création littéraire : le cas des Illuminés de Nerval’, Cahiers de l’Association internationale des études françaises 52.1 (2000): 183-199. Max Milner, ‘Les Illuminés’, in Gérard de Nerval : Œuvres Complètes II, ed. J. Guillaume and C. Pichois (Paris: Gallimard, 1984), 1699. The dried and pickled hand of a hanged man, which, when used as a candle, was believed to render observers motionless. Jean-Luc Steinmetz, ‘La Main enchantée : Notice’, in Nerval, OC III, 1136. Robert Mandrou, ‘Littérature de colportage et mentalités paysannes, XVIIe-XVIIIe siècles’, Études rurales 15.15 (1964): 72-85. Colportage was the custom of selling goods (books, newspapers, engravings, fabric, trinkets, ointments etc.) to rural customers through travelling merchants. After the famous sixteenth-century clown. Henri Weber, ‘La facétie et la littérature facétieuse au colloque de Goutelas’, Bulletin de l’Association d’étude sur l’humanisme, la réforme et la renaissance 6 (1977): 28-33. Jacques Bony, ‘Contes et facéties: notice générale’, OC III, 1113. Bony, ‘Contes et facéties’, OC III, 1113. Nerval had published a translation of Goethe’s Faust in 1828. Bony, ‘Contes et facéties’, OC III, 1114. Nerval, OC III, 735. A similar incident is recounted by Nerval in a letter to Georges Bell on 1 June 1854 (OC III, 855-856). Anne Mounic, ‘Les mains de Nerval, Maupassant et Verlaine’, Temporel 5 (2008). Accessed 30 March 2015, http://temporel.fr/Les-mains-de-Nerval-Maupassant-et . Steinmetz, ‘La Main enchantée : Notice’, 1120. Jacques Bony, Le Récit nervalien (Paris: José Corti, 1990), 134. Bony, Le Récit nervalien, 133. Charles Mauron, ‘Nerval et la psycho-critique’, Cahiers du Sud 293 (January-February 1949): 76-92. Sigmund Freud, ‘The Uncanny’ in An Infantile Neurosis and Other Works. The Standard Edition of the Complete Psychological Works of Sigmund Freud, Vol XVII, trans. James Strachey (London: The Hogarth Press, 1955), 244. Nerval, OC III, 364. Translation: ‘using cartomancy, palmistry, and Pythagorean numbers’. The reference to ‘les nombres pythagoriques’ is likely to evoke a kind of numerology supposedly based on the teachings of Pythagoras. This card is labelled only with the number XIII in the tarot d’Épinal. Thierry Miguet mentions that the maître Gonin ‘rappelle le bateleur du jeu de tarots’ (Thierry Miguet, ‘Formes, nombres et couleurs dans La Main enchantée’ in Nerval : une poétique du rêve, eds. André Guyaux and Robert Kopp (Paris: Honoré Champion, 1989), 69. Nerval, OC III, 372. Translation: ‘a basket-hilted sword that had lost its basket, a copper sallet and hauberk that were crying out for the coppersmith’s hammer’. I am grateful to Alan Jackson for his help with this translation. Thierry Miguet draws a link between Eustache and the tarot fool in Nerval’s description, later in the text, of Eustache ‘tremblant le grelot’ (Nerval, OC III, 389) before his execution: ‘ce grelot qui est l’un des emblèmes du fou et du Mat de l’arcane sans nombre’. (Thierry Miguet, ‘Formes, nombres et couleurs’, 77). Although we do not know what kind of cards he was using, the escamoteur claims to have gained his knowledge about Eustache’s life based on just one card.